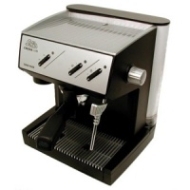 alaTest has collected and analyzed 25 reviews of Solis SL 70 Espresso Machine. The average rating for this product is 3.8/5, compared to an average rating of 4.4/5 for other products in the same category for all reviews. Reviewers really like the reliability and size. The durability and usability also get good opinions, but comments about the noise and price are mixed. Many are less positive about the maintenance and design. We analyzed user and expert ratings, product age and more factors. Compared to other products in the same category the Solis SL 70 Espresso Machine is awarded an overall alaScore™ of 76/100 = Good quality. Great machine but no longer made. Did Solis go under? The repair person said it would take an hour to fix. He's had the machine 3 weeks! Don't buy from espressoparts.com. We are still waiting for the machine. Not happy having to buy our latte's. I bought it based on what I read here. I originally wanted to buy a super-automatic but taste test done in the stores and at home on machine on loan convinced us to go to a semi-automatic. One year later I need a new machine. Terrific entry level machine with a mega-steamer for the milk-based drink fan. But has price risen too high? Sorry for probably the most tardy review in coffeegeek history. This one is a few years late, but I felt I should share my experience. Best-in-class steaming makes this unit a compelling value. I've used this machine for a couple lattes every morning for a little more than a year, with the occasional guest coming over. This machine is legit, and I haven't yet experienced the reliability problems some people mention. Don't buy this machine, it doesn't last! This machine has excellent build and parts quality for the money. Not overly picky about the grinds you put in either. Nice pump power. Great for a newbie and equally good for the connosieur. I'd look for a machine that has better construction and a longer warranty. A $300 machine shouldn't simply die in three years. Outside a few "dream" upgrades, the best in its class.